It feels like only yesterday that the explosion of oriental slots hit the market. 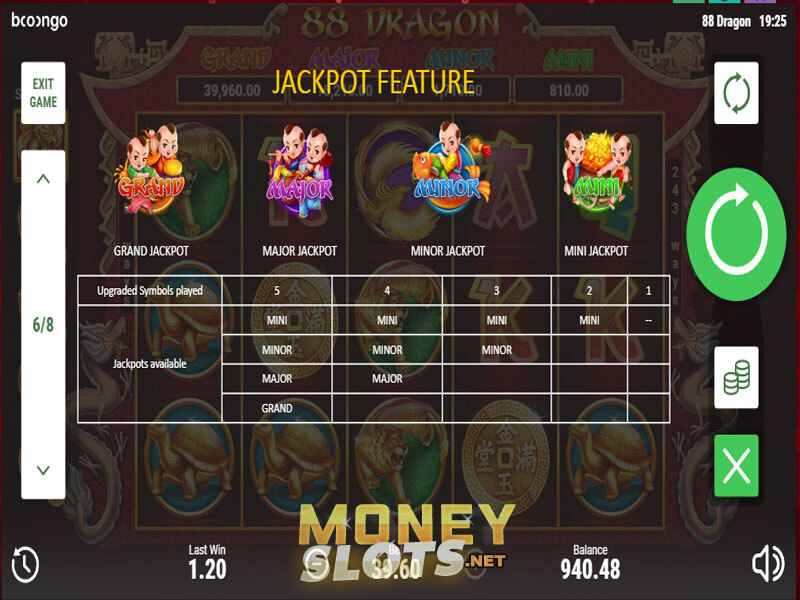 Of course, that was a few years ago, when China lifted the ban on foreign slot companies operating within its borders, and ever since, we’ve had a mountain of titles drawing inspiration from Chinese mythology in hopes of appealing to the new and sizeable market. Now, in 2018, we’re graced to yet another title by Booongo Gaming that tackles this time, filled with red and gold on its reels, and prominently featuring the number 8, which is considered a lucky number for business men and people seeking wealth. The title has a familiar 5x3 playing field with 243 ways to win instead of regular paylines, requiring only that you collect three or more adjacent symbols left to right together to collect a win. The symbols are a mixture of playing card icons and animals that can come in either their regular shape, or a gold-plated one. Despite the familiar reel layout, you can’t sink into a sense of comfort. The title has four fixed jackpots sitting above the reels the entire time, which go up and down depending on how big your wager is. Which fixed jackpot you can activate and win depends on how many symbols you’ve upgraded. The way you do this is by selecting the icons themselves left of the reel, where you can pick how many you want to upgrade. This allows you access to more fixed jackpots, but also increases your wager. The jackpot feature has a chance to activate each time when a Wild lands on the playing field. It takes you to a separate screen with twelve coins, which you flip open to reveal symbols for the jackpots you have activated. Once three of the same jackpot have been collected, you are rewarded that jackpot. On top of that, you also have free spins, which you need to collect three Scatters for. They only appear on the first, third and fifth reel, and reward ten free spins, with the possibility of retriggering the bonus. The biggest advantage of free spins is that low paying symbols do not appear while it is active, increasing your chances of big wins and activating the jackpot feature. The playing field is the same 5x3 reel setup you have seen in countless other titles, so there’s not much to really surprise you here. As there are no paylines, and instead, the title uses adjacent symbols to award wins, you only need to worry about setting the wager and upgrading symbols. Upgrading symbols increases the amount of money they reward, but it also increases your awger. You can play this title for as little as $0.08 up to the maximum of $39,60 with all upgraded symbols and maximum bet. The grand jackpot, the biggest win in the whole title, amounts to a 1010x win, or $39,960 at the highest wager. Like in other Booongo titles, there’s an option to enable Autoplay, which will keep spinning the reels until you press it again to stop. The big thing to take away from this title is that it adjusts itself to your budget. 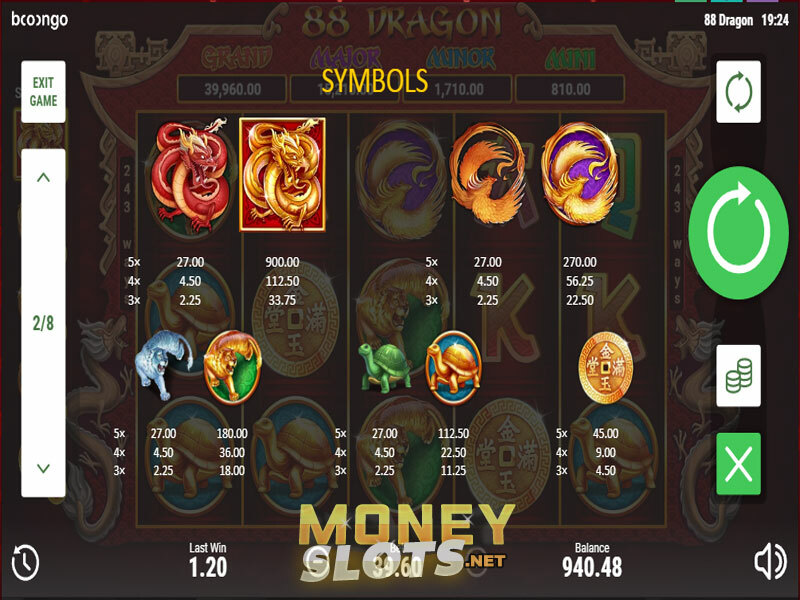 It’s better to play a lower wage with a bigger amount of upgraded symbols, as it gives you a shot at the biggest fixed jackpots, and it means more icons will have better pays. There aren’t many big differences between 88 Dragon’s desktop and mobile versions. The title features the same user interface on both mobile and desktop.